This Product Ships to Australia only. Product Type: Protein Powders / Post Workout Protein / Whey Protein Hydrolysate / Whey Protein Isolate (WPI) / Applicable for male and females. This protein is classed into multiple categories. 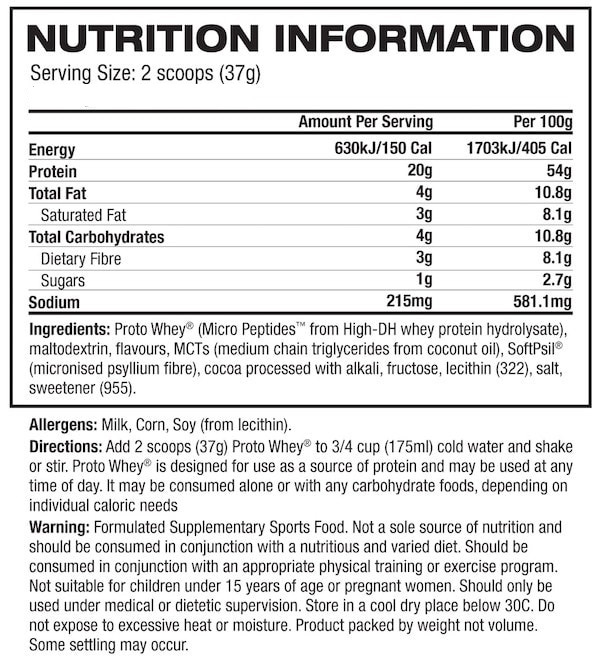 This Whey Protein Isolate/Hydrolysate is applicable for consumption by both male and females. It is best for increasing muscle mass, losing weight, improving recovery time and overall athletic performance. Whey protein isolate is among the best types of Whey due to it having the highest protein content and the lowest carbohydrate and fat content than any other whey. 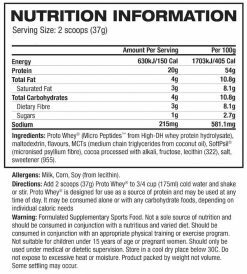 This type of whey protein also contains the least amount of lactose, making it applicable for most people who are lactose intolerant. Whey protein isolate will also digest within 30mins which will enable the consumer to eat regularly with minimal disruptions to their meal patterns. 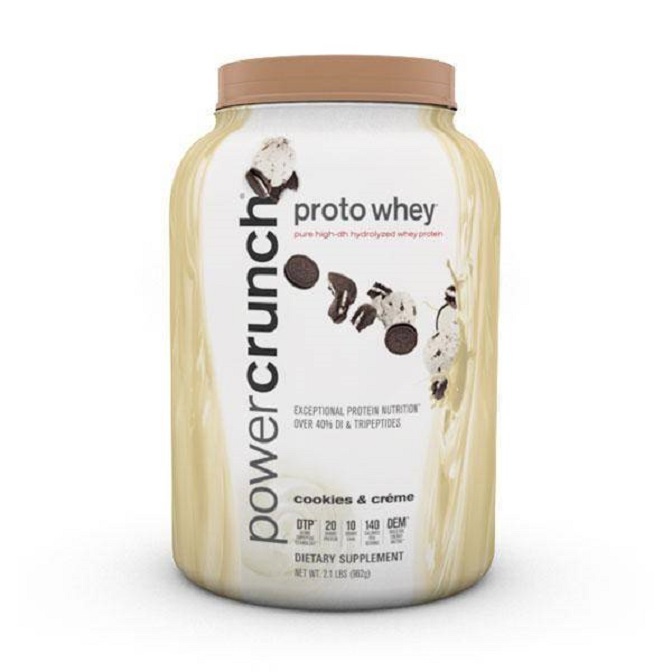 Proto Whey Protein is the key protein to be taking as it is a pure high-DH hydrolysed whey protein product that targets muscle growth, strengthening, endurance and recovery. Its vital role ensures the rapid absorption of protein. Proto Whey Protein takes its own route and is absorbed directly into the blood skipping the digestive system due to its unique ingredients containing 55% of micro peptides and medium chain triglycerides (MCT). This means better gut absorption and efficiency and therefore better supply of protein to be used by muscles. Whey protein is uniquely known as one of the purest protein available as it is shredded of carbohydrates and fats. 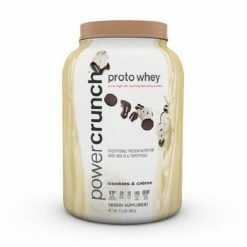 Proto Whey Protein is also a hydrolyzed whey protein that therefore is more soluble in the body further ensuring rapid absorption. It is ideal for any athlete or body builder allowing you to workout harder and achieve the results you deserve. The key ingredients include micro peptides, medium chain triglycerides, and L-glutamine. Micro peptides are essential for the rapid absorption of protein as they can to exert their actions in the body. MCT’s are fatty acids proven to boost your metabolism and minimize any protein degradation that occurs in the muscles. L-glutamine is a specific amino acid essential for muscle growth, endurance, and recovery. Normally glutamine levels decrease after a workout thereby increasing L-glutamine levels in the blood can ensure a rapid recovery allowing muscle strength and protein synthesis to improve and take place. Mix 1 (one) scoop with 250mL of water and consume immediately after completing your workout (post-workout). Can be taken for breakfast and or whenever protein is needed in the day. Can also be consumed 30 minutes before workout if needed. Cost Price Supplements is the leading Australian retailer for Weight Loss Surgery Supplements. Home of the Protein Perfection Protein Water. For faster checkout, login or register using your social account.